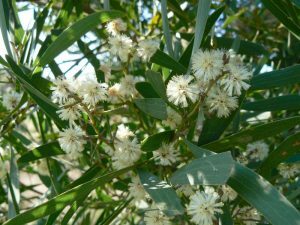 Acacia melanoxylon, known as Australian Blackwood, is native to eastern Australia, and grows prolifically in South Africa. It is an upright tree growing up to 30 m tall. scaly. Younger branches are ribbed, angular, or flattened towards their tips and are greenish in colour. The leaves of this plant are actually flattened and widened leaf stalks (i.e. petioles), and not leaves in the true sense of the word. These leaf stalks are called phyllodes, but serve the same function as a regular leaf. The dark green to greyish-green phyllodes (4-16 cm long and 6-30 mm wide) are quite variable in shape. However, they are generally narrowly elliptic and usually about 4-12 times longer than they are wide. They are straight to slightly curved and are usually tapered towards the base, with a glossy appearance and a slightly leathery texture. They usually have three to five prominent veins running lengthwise and rounded to pointed tips. a large number of flowers. 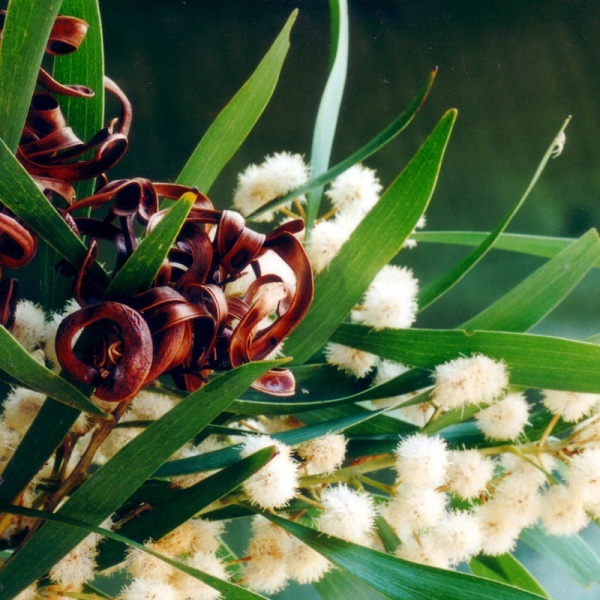 The flower clusters are borne on stalks and are alternately arranged on a short branch. Flowering can occur throughout the year, but is most prominent from September to December. are broadly oval in shape – 3-5mm long and 2-3mm wide -, glossy in appearance, and black in colour. 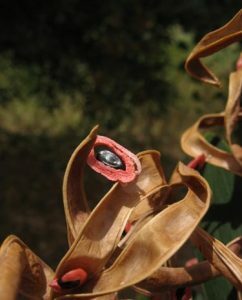 They are almost encircled by a large pink, pinkish-red folded fleshy structure. This species reproduces mainly by seed, which are known to germinate prolifically after a fire. It also sprouts from root suckers, particularly when the roots are damaged. Root suckers can spread some distance and cause the formation of thick clumps from a single tree. 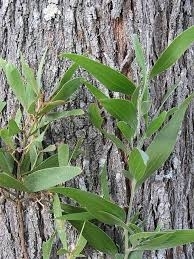 In traditional medicine, an analgesic is derived from the tree. 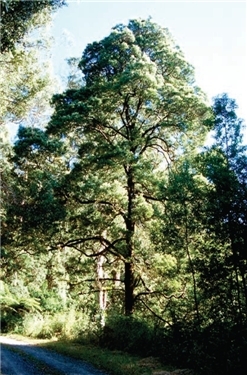 Blackwood varies in colour from creamy-yellow through red-brown to dark brown. Sapwood may range in colour from straw to grey-white with clear demarcation from the heartwood. The heartwood is golden to dark brown with dark-brown growth rings. The timber is generally straight grained but may be wavy or interlocked. The wood is lustrous and possesses a fine texture. The name of the wood may refer to dark stains on the hands of woodworkers, caused by the high levels of tannin in the timber. The timber is not easy to work. It may be nailed with ease, but gluing may produce rather variable results. The wood may be stained easily and produces a high-quality finish. It is well-suited for steambending. The timber compares favourably with stinkwood and is a very valuable and a highly priced furniture wood. It is also in demand for furniture and cabinet work, paneling and flooring. It may also be used for producing decorative veneers. It is used in boat building, decorative boxes and wooden kegs. Plain and figured Blackwood is used in musical instrument making – in particular guitars, drums, violin bows and organ pipes. If you are looking to buy wood, please click here to visit our Timber slab sales page.